Beyond the logistics of moving and selling illegal timber, a former smuggler says he used to pay thousands of dollars in bribes to officials to move his products. The mobile checkpoints move from place to place, giving Myanmar’s timber management authority the element of surprise. Sometimes smuggled timber is abandoned, other times the smuggler is captured, surprise search and seizure operations have become a strong deterrent. NORTHERN SHAN STATE, Myanmar – Looking back, it just seemed natural for Aung Tin Oo* to become a timber smuggler. Especially given that he hails from a central trading point in Myanmar near Mandalay. Timber smuggling has long been a hot business there, and Oo’s friends and uncles were doing it at the time. They assured him that it was the “get-rich” fast path. That was the start of a four-year smuggling career. Oo is now retired and in his mid-40’s. He began as a smuggler who would occasionally bring timber along while working as a taxi driver. Then he worked up to owning three small cars for timber smuggling, then to a mini van, and finally to an actual trader. As a trader, he was personally involved in purchasing and selling timber at the China-Myanmar border. A check point 15 miles from Lashio in Northern Shan. Forestry department officers set up mobile check points to inspect incoming trucks for illegal timber. Photo by Ann Wang for Mongabay. Sitting in his brick home in Myanmar’s Northern Shan state with his young son, Oo describes his numerous trips into the wild forest to buy timber. He shows a picture of himself chest-deep in a river to transport timber as proof of his exploits. It’s a three-month journey from buying timber at the logging sites in Sagaing forest in northwest Myanmar to crossing the Mandalay-Muse road to China. Despite his time as a timber smuggler, Oo is a proud man. He says he did it for his family, but also admits the money and adventure were draws. When asked whether his life was in danger, he smiles and makes the gesture of counting money with his fingers. In the end, smuggling is a cash-heavy business that at least half a dozen types of individuals profit from. It’s difficult to say who profits and how much, but business is still good. According to Oo, the smugglers are usually prepared with cash, paying off checkpoint officers to bypass inspecting their cars, and working with armed groups to finish transporting timber across the border to China. Bribes and payoffs can be hefty. A recent nearly year-long investigation by Mongabay into illegal timber trading routes from Myanmar to China revealed that on one road alone the annual payouts to officials and military could be as high as $10 million a year just for charcoal made from area timber. Beyond being complicated and dangerous, timber smuggling is also no cheap task – and not just because of the bribes. A calculation by Oo of payments he gave out make the cost of moving the timber from forest to be about $2,500 per every ton of wood. And don’t forget the bribery fee for checkpoint officers. Forest Department officers inspect trucks on the side of the highway by climbing up the trucks to look with flashlights. Photo by Ann Wang for Mongabay. “I used to personally give money to the check point officers not to check my cars unless there were high-ranking officers,” Oo said. “I had to pay 100,000 kyats ($75) in each toll gates.” There can be as many as half a dozen checkpoints on these types of routes. According to Forest Act Section 39(1)(B), the import, export, collection or moving of any forest produce without prior written permission from the forest authorities is prohibited. All wood is considered legal if it has the stamps of the state-owned Myanmar Timber Enterprise (MTE) under the Ministry of Environmental Conservation and Forests (MOECAF) and is exported via Yangon’s seaports. In other words, any timber trade via land within or from Myanmar is illegal. Yet unless you get caught, losing money smuggling timber seems to be nearly impossible. Some species of rare and endangered wood, such as rosewood, fetch an incredibly high price. He adds that to really play the game it’s all about upgrading tools and inventory. The smugglers often work in concentrated groups and rely on a well-connected network of informants along the highway to China to avoid capture. “I was never even close to getting arrested because we usually go in groups like 10 cars, so if our group is passing one toll gate, the officers would get at least $365,” Oo said. 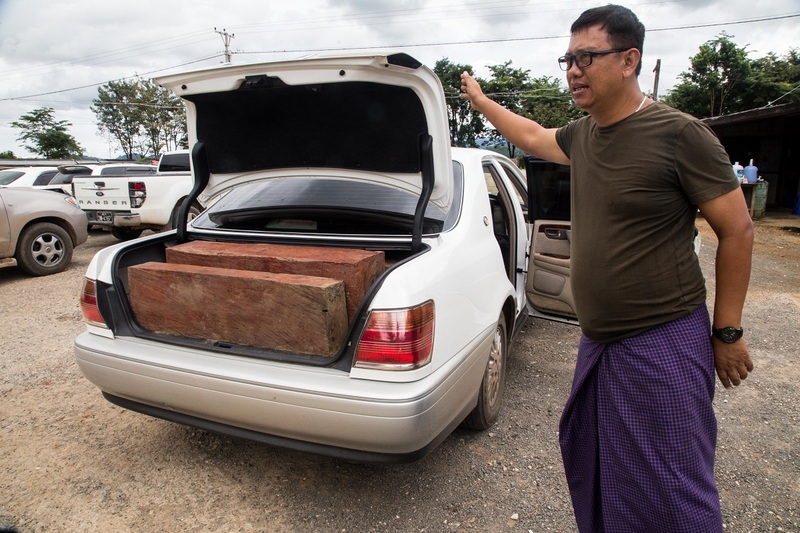 U Tin Myo Aung, assistant director of Yu Pu check point, displaying a seized car loaded with smuggled rosewood destined for China. Photo by Ann Wang for Mongabay. Oo retired from the smuggling business three years ago and now runs a DVD shop. He says he made the change for personal reasons, but also because of the increasingly unpredictable and tightening mobile checkpoints. A mobile check point moves around the highway to carry out surprise checks, usually with a smaller team of officers. For Oo and other smugglers at the time, there rate of arrests – more than four dozen a day – made the risk just too high for the potential reward. The mobile units continue to operate today. For land timber smuggling, there are two main roads to China. One is through Kachin State and another is via Northern Shan State. After the arrest of 155 Chinese nationals caught logging in Kachin in 2015 , there continues to be conflict between KIA and Tatmadaw Kachin Independent Army, ethnic armed groups in the north and the Myanmar military. The conflict and related movements cause roads to be shut down. The timber trade is focused mainly throughout Northern Shan State to China. In theory, to tackle illegal timber trade via land authorities just have to apprehend the smugglers on the one main road to China, the Mandalay-Muse Road, a 450-kilometer (280 miles) journey to China. They work in teams. While one forestry department officer asks for documents from a truck driver, another one will bang on the side of the truck with his bare hands. Based on experience, the officer will usually know if there is timber inside the truck from the sound of the echo. Just to be certain, another officer might climb up the truck and stick a waist long iron stick through the stock pile to feel if there is hidden timber. The team is made up of five Forest Department officers and five Forest Department policeman. None are armed nor wearing protective gear or security cameras. This is typical of a Forest Department mobile checkpoint team. 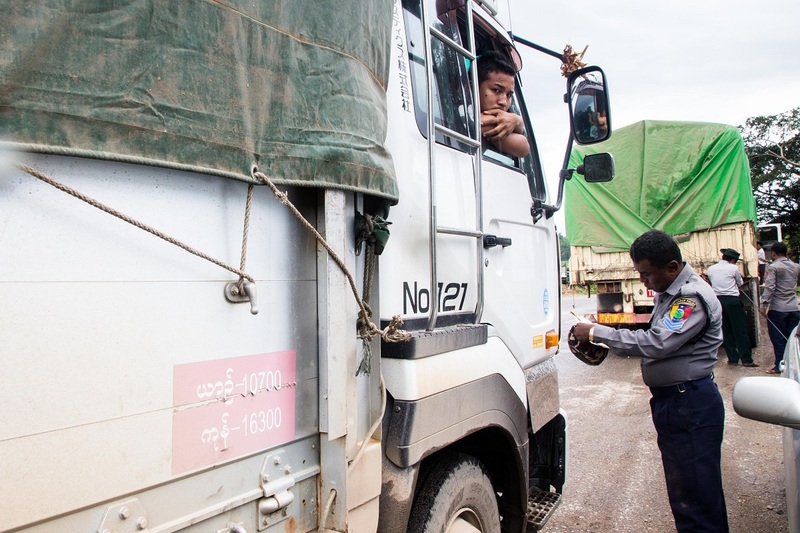 Operating between speeding trucks, mobile inspection teams do surprise checks between Nawnghkio and Muse, a 331 kilometer (205 miles) route, part of the Mandalay-Muse road. The Mandalay-Muse road is one of Myanmar’s most important routes. 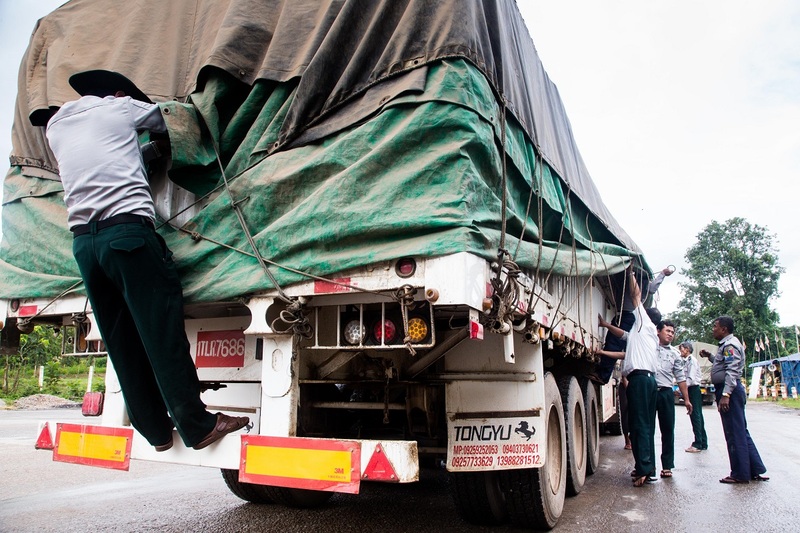 Each day about 1,500 trucks travel the road, which accounts for up to 80 percent of trade between Myanmar and its largest trading partner, China. Between 15,000 and 20,000 tons of good pass daily along the road, much of it is agricultural products from Myanmar, according to the Ministry of Commerce. Yu Pu check point, 52 miles from Lashio on the way to China, is permanent and the last check point in Northern Shan before trucks go into armed group territories. The check point was hit by a rocket in December 2016 by armed groups warning against interference with their smuggling business. Photo by Ann Wang for Mongabay. The road is also currently under heavy construction for widening. There is another catch. Although there are three permanent checkpoints – Mandalay, Yu Pu, and Muse – if smugglers can bypass the Yu Pu checkpoint, they can detour via small roads into armed group territory and trade the timber via unofficial borders. In that case, there is nothing the forestry department officers can do. But it has not stopped the operations of the Lashio office. According to their records, they have seized a total of 435.6 tons of illegal timber between July to August, the majority of which was redwood, coveted for furniture in China. All current information can be find on Lashio Forestry department’s Facebook page, the first active state social media account for the public to monitor the work of a state level forestry department. The page has garnered both hatred and praise, but forestry officials say they have a higher purpose. They want to increase transparency in their work, raise awareness about illegal logging, and hopefully receive tips from the public. It’s only U Tin Myo Aung’s third month working as the assistant director of Yu Pu checkpoint, who is a custom officer from the Ministry of Planning and Finance. To avoid corporation, it’s a six month to one year position. 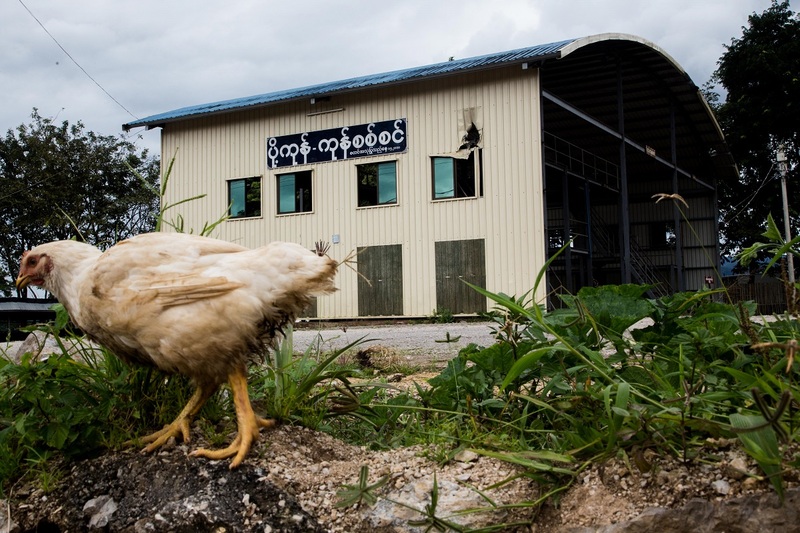 “Nobody wanted to come work at this post, the work is tiring, the location is far and it’s very dangerous,” Aung said. He originally worked from the office in Yangon, the commercial capital of Myanmar. There have already been at least 30 arrests related to timber smuggling since he took the position, he said. The situation at the Yu Pu checkpoint is no easier than at Lashio. Located between two hills, both occupied with armed groups Lashio is just one hour from China. The first thing one notices about Yu Pu checkpoint is a big hole in the wall of the booth for truck inspection. A rocket hit the checkpoint in December 2016 to warn officers of their presence and their business interests. It was closed in 2010 and reopened in January 2017. The armed group has set up three explosives at their gate within this year. A driver (far left) helps officers inspect his truck for illegal timber. Photo by Ann Wang for Mongabay. Yu Pu checkpoint is a joint operation with 12 departments, including the forestry department and has a total of 81 staff, working in 24-hour shifts with armed forces guarding the location. The operation priorities are to seize the timber first, but it is equally important to arrest the smugglers for further investigation into illegal logging, according to Aung. However, it’s usually one or the other. Both the operation team and the smugglers rely heavily on local informants, and the smugglers usually abandon their car with the timber, and disappear into roadside restaurants or villages before officers can reach them. Many officers believe that no matter what they do, illegal trade will still happen as long as there is demand. “I would like China to stop buying illegal wood,”Aung said. China is the world’s largest importer of logs and wood pulp, it imported 48.7 million cubic meters of logs in 2016 – an increase of 9 percent from 2015, with most logs coming from Russia, USA, New Zealand and Canada, according to the official China Customs statistics website. A MoU was signed between Myanmar and China during Myanmar’s presidents U Htin Kyaw’s visit to China in April, 2017. Lin Ji is executive secretary for Global Environmental Institute (GEI), a Chinese NGO based in Beijing. Their mission is to design and implement market-based models for solving environmental problems. Ji said China has previously avoided collaborating with Myanmar because of an unfriendly atmosphere toward China. *Names have been changed for the safety of the interview subjects. Banner image: A car of seized rosewood close to Yu Pu check point. The driver heard rumors of an active check point and left his car at a nearby restaurant and disappeared before the officers arrived. Photo by Ann Wang for Mongabay. Editor’s Note: An interview reflecting the perspective of China was added to an updated version of the story.